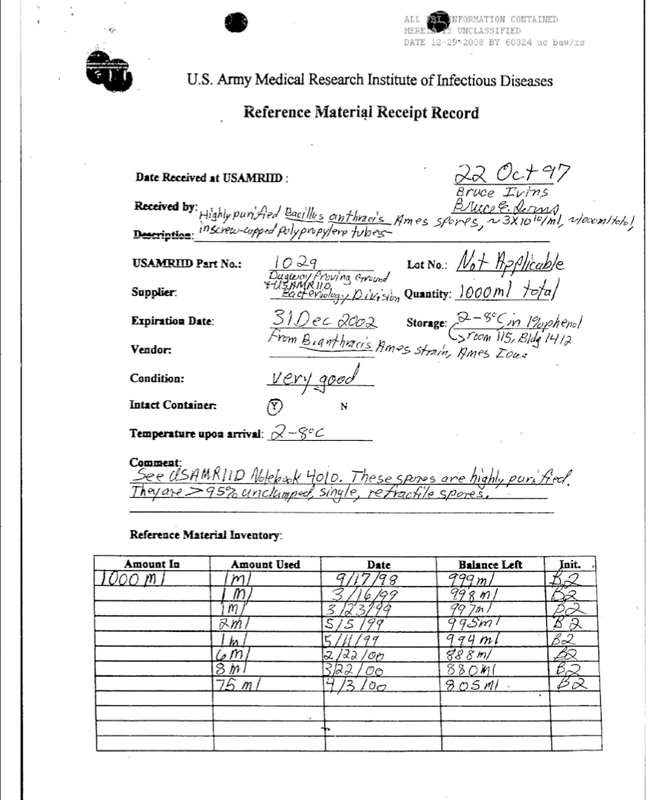 2014 August « CASE CLOSED … what really happened in the 2001 anthrax attacks? 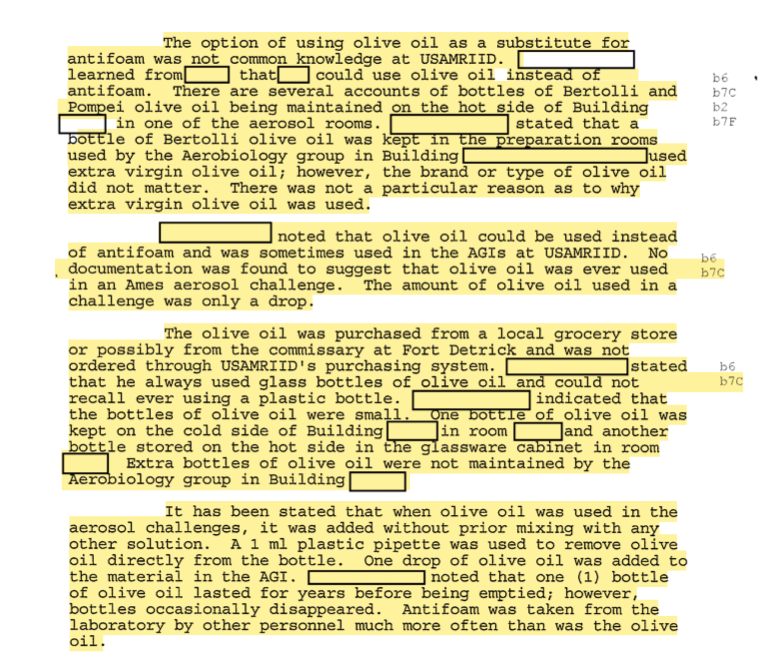 * Chemical Analysis of Mailed Anthrax: Was Olive Oil Detected In the Anthrax Mailed In Fall 2001? * The FBI’s review showed that 300 identifiable individuals entered rooms providing access to the Ames material used in the aerosol challenges. 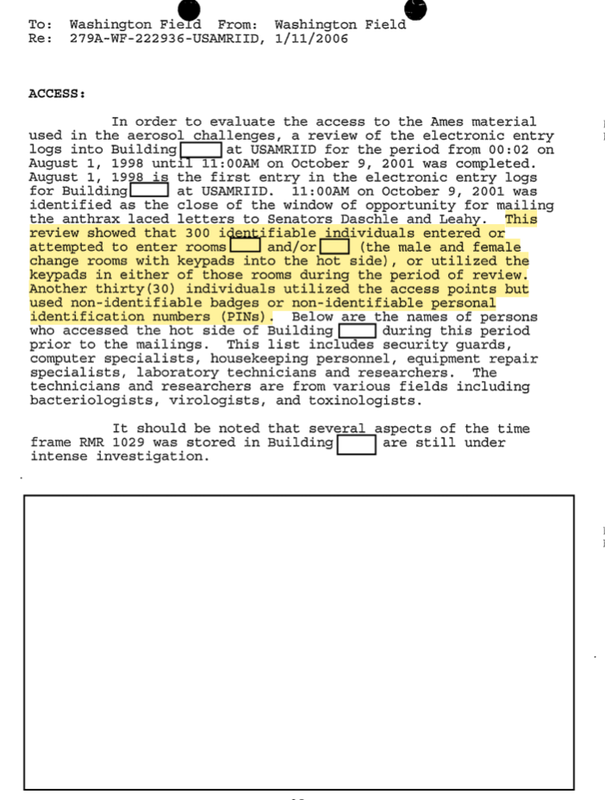 Another thirty (30) individuals utilized the access points but used non-identifiable badges or non-identifiable personal identification numbers; so that would make 330 individuals who needed to be eliminated in connection to that single building at USAMRIID — including 30 who were not identifiable. * Bloodhounds were deployed against USAMRIID Aerobiology (Building 1412) Personnel; over 100 locations were to be checked by bloodhounds for matching human scent taken from the original anthrax tainted letters and envelopes. Will Mueller ever admit they were wrong? WASHINGTON (AP) — FBI scientists early on had — but destroyed — the unique strain of anthrax used in the deadly 2001 attacks that years later would lead them to Dr. Bruce Ivins, the government’s top suspect in the nation’s biggest bioterror case. FBI Assistant Director Vahid Majidi said Monday the initial anthrax sample that Ivins took from his Army lab in February 2002 and gave investigators did not meet court-ordered conditions for its preparation and collection. In a briefing for reporters, Majidi said the sample kept at the FBI lab was destroyed because the bureau believed it might not have been allowed as evidence at trial. “Looking at hindsight, obviously we would do things differently today,” Majidi said. When does summer end? Most people would say in another two weeks or so. 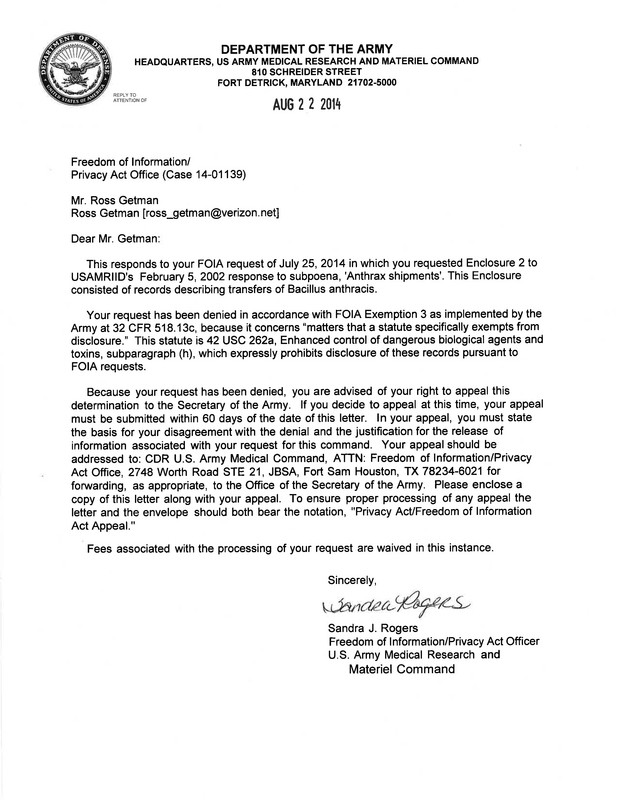 When will GAO issue its report? … Summer has already become “maybe early fall.” … Will that soon become “late fall or winter?” … Which will eventually become “never?” I would love to be surprised. By the way, my view has not changed. The FBI’s case against Dr. Ivins is clearly bogus: no evidence, no witnesses, an impossible timeline. The real questions are why the FBI persists in sticking to such a pathetic story and why it is taking GAO so long to issue its report? WASHINGTON (Reuters) – A U.S. congressional committee investigating the mishandling of anthrax at the Centers for Disease Control and Prevention (CDC) asked a federal watchdog agency on Thursday to review U.S. lab procedures for handling dangerous pathogens. In a letter to the Government Accountability Office (GAO), the House Energy and Commerce Committee called for GAO to provide details about current federal lab policies and procedures and guidance on whether agencies that run biosecurity labs have undertaken efforts to assess and improve their practices. 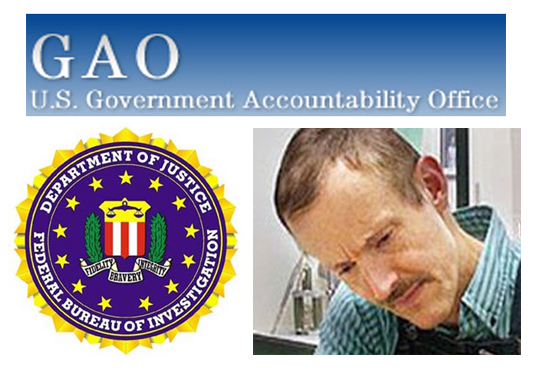 The GAO oversight in the past five years has not even resulted in disclosure of all 20 of the labs that the FBI know had virulent Ames pre-911, let alone those labs had the x101 and x102 plasmids and avirulent Ames that combined could have been used in the Fall 2001 mailing. 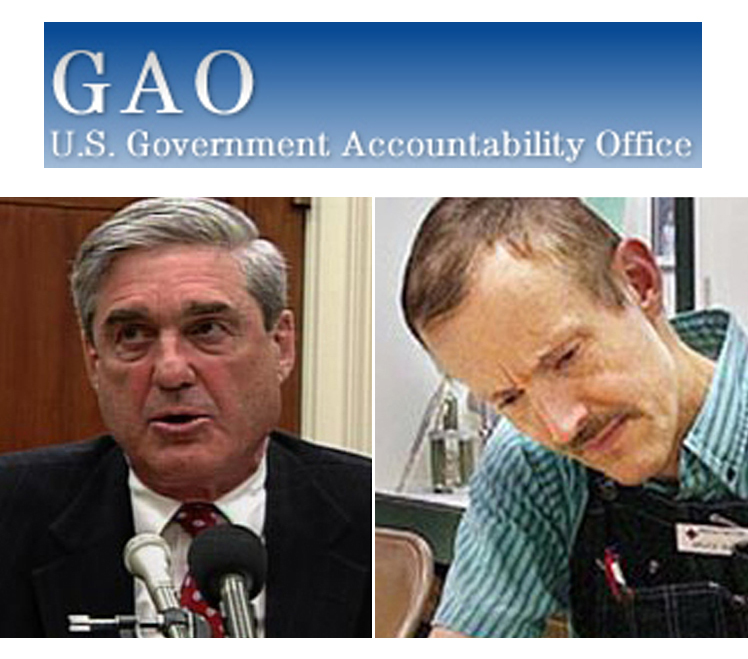 The GAO has no teeth and faced with an agency such as the FBI unwilling or slow to make disclosures — and seemingly institutionally incapable of revisiting past mistakes — can only use jawboning as the years pass. Meanwhile, Dr. Ivins is still dead and Al Qaeda still wants to kill New Yorkers in a mass attack that would end life in the United States as we know it. This is not a time to brook a delay in producing requested documents. Or not to request all relevant documents. NOTE: The GAO is years behind its initial promises regarding its review of the FBI anthrax investigation. Its latest promise was to issue a report this summer, which is now half over.